Hickenlooper orders Colorado not to help with Trump's policy of separating immigrant families - Denverite, the Denver site! Jun. 18, 2018, 10:52 a.m.
Gov. John Hickenlooper on Monday signed an order that forbids Colorado’s government from helping the federal government enforce its new policy of separating immigrant children from their parents. “The U.S. Department of Homeland Security’s policy and practice of separating children from their parents when arriving at the southern border is offensive to our core values as Coloradans and as a country,” reads a new executive order. The order says that state agencies cannot uses “for the purpose of separating any child from his or her parent or legal guardian” if the only basis is a suspected immigration violation. It doesn’t apply to cases where a court has ordered a child to be removed for their own protection. The governor described the order as a “rebuke” of the Trump administration, according to Brandon Rittiman of 9News. Hickenlooper isn’t aware of any current use of state resources to support separations, Rittiman reported. Earlier in the morning, a couple hundred people gathered outside of Governor Hickenlooper’s office and called on him to issue an executive action to make Colorado a “sanctuary state.” Their action comes after Attorney General Jeff Sessions announced a family separation policy in dealing with migrants crossing the U.S. southern border and detention facilities for minors became central to the national immigration debate. Salazar pointed to a nearby plaque of Governor Ralph Carr, who famously spoke out against Japanese internment during World War II. Salazar has tried to pass a number of bills in Carr’s name to protect immigrant families. Among the speakers was Fanny Starr, a 96-year-old Holocaust survivor who has been active in remembrance events in Colorado for years, U.S. House candidate Saira Rao and State Representative Leslie Herod. 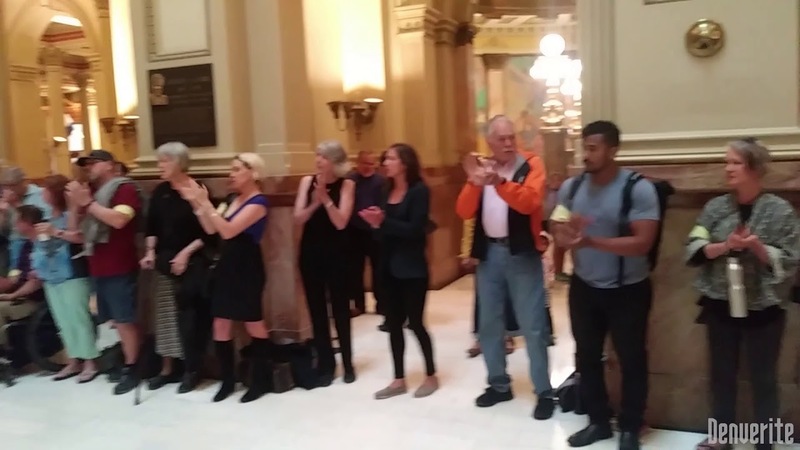 Hickenlooper was apparently in the building when the protesters showed up, but he did not emerge from his office during the action. He did issue a letter to congressional leaders that asked for legislation to prevent future family separations. After the protest dissolved, Hickenlooper invited Rao and Starr into his office to talk.